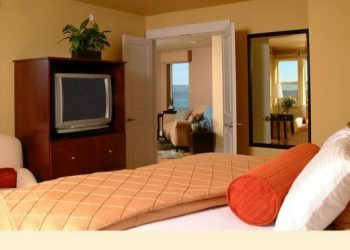 Experience the majesty of the mighty Columbia River from the comfort of your hotel room. 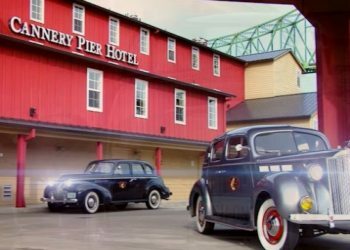 The Cannery Pier Hotel was built on the site of the former Union Fish Cannery, 600 feet into the river. This Astoria Hotel offers guests unparalleled views of a real working river, as well as views out to Cape Disappointment Lighthouse and nearby Washington. Each room has a private balcony and is lavishly well-appointed with a fireplace, hardwood floors, and luxurious amenities. Take advantage of the full-service Cannery Pier Hotel Spa, an authentic Finnish sauna and a fitness room; or learn more about Astoria's heyday as the Cannery Capital of the World on our Museum Walk. 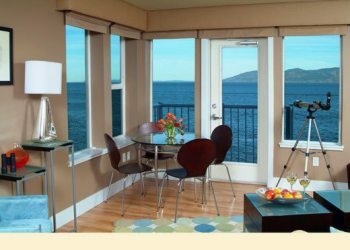 For the ultimate in comfort and luxury, and a uniquely historical Astorian experience, think of the Cannery Pier Hotel. The Cannery Pier Hotel rests on the 100 year-old pilings that formerly supported the Union Fisherman's Cooperative Packing Company. Formed in 1897, it was the result of a turbulent time that favored big business cannery owners instead of the fishermen. Disputes with cannery owners about prices per fish started in 1876, with fishermen going on strike, and in 1880 they formed the Columbia River Fishermen's Protective Union. Tensions came to a head in 1896 when the fishermen went on strike again. Two strike-breakers were shot and more violence threatened, and the Oregon National Guard was called in to break the strike. After this, about 200 fishermen (mostly Finnish) came together, pooled their resources, and formed the Union Fisherman's Cooperative Packing Company. By 1904, it had become the largest cannery in Astoria. It remained a fishermen-owned business until the late 1940's. 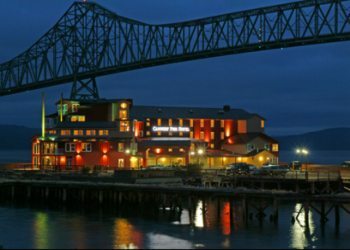 The Cannery Pier Hotel could only exist in Astoria, Oregon, the oldest settlement West of the Rockies. Founded in 1811 by John Jacob Astor, the city of Astoria is located in the culturally and geographically-rich Northwest corner of Oregon where the Columbia River and the Pacific Ocean meet. With its diverse ship traffic and Victorian homes, and a history built on trees, fish, and water, vibrant Astoria embraces its past while it enjoys its status as a unique Northwest Community . A city with a population of 10,000 people, Astoria has enough to culturally please yet still give a small-town atmosphere.. Enjoy an opera or concert at the Liberty Theater, explore the end of the Lewis and Clark Trail at the Lewis and Clark National Park, or watch the sea lions along the Riverfront Walk connecting the Cannery Pier Hotel to Astoria's National Downtown Historic District and beyond.